Last night the Urbana Park District hosted a winter solstice night hike at Meadowbrook Park, and Jackie and I had a great time walking with Savannah, the park district guide, and the nearly a dozen people who attended. The winter solstice is always a hard day for me. The longest night should be the day things finally start to get better, but I have trouble finding solace in that truth. Making a bit of a ceremony of the solstice helps. In years past—pretty much without even thinking about it—I have always fought against the gathering dark. My reaction to this tweet by Jonathan Mead is a good example. The more you resist the seasons the more you’ll pay later. Sink into the darkness. There’s no better time than now to fully recharge. “Good advice,” I say, vowing never to give in. I’ll gladly pay more later, when the light has returned. A lot more. That particular reaction—so automatic, and so strong—prompted some thinking over the past year. Maybe there was something to the idea. Could it be that there’s a way to concede to the dark and cold without sinking into depression? This winter I will experiment with that idea. I mean, it’s going to be cold and dark whether I rail against it or not. Maybe a bit of acceptance could help? I’ll post more on this as winter progresses. The night did not fully cooperate. The sky was overcast, which meant that we couldn’t see much in the way of planets or constellations. We didn’t hear any owls, despite Savannah’s best efforts to call to them, nor did we hear any coyotes. It wasn’t even as dark as it might have been—the low clouds caught and reflected the light pollution from Urbana and campus. None of which meant the walk fell short of my hopes. Savannah talked about the history of Meadowbrook Park, and showed us several of their current projects—restoring native plants along Douglas Creek (Jackie helped with that one) and opening up some space along the Hickman Wildflower Walk. She talked about the Barred Owls in the woods to the west and the Great Horned Owls in the woods to the east. She talked about the few local species that hibernate, and compared them to the local species that instead engaged in winter sleeping. She took us to the Freyfogle Prairie Overlook and told us it was the highest point in the park—an amusing notion in a place so flat. It was dark enough that I didn’t want to try to take pictures, so the pictures on this post are from earlier visits to Meadowbrook Park. 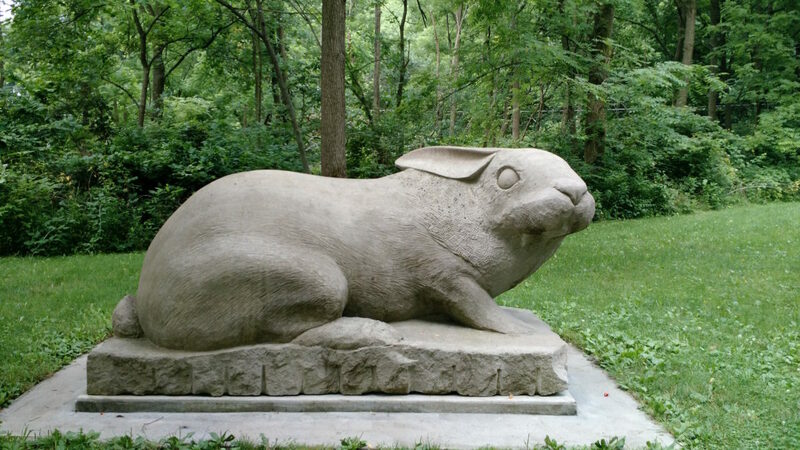 The rabbit in the picture at the top is one of my favorite sculptures. 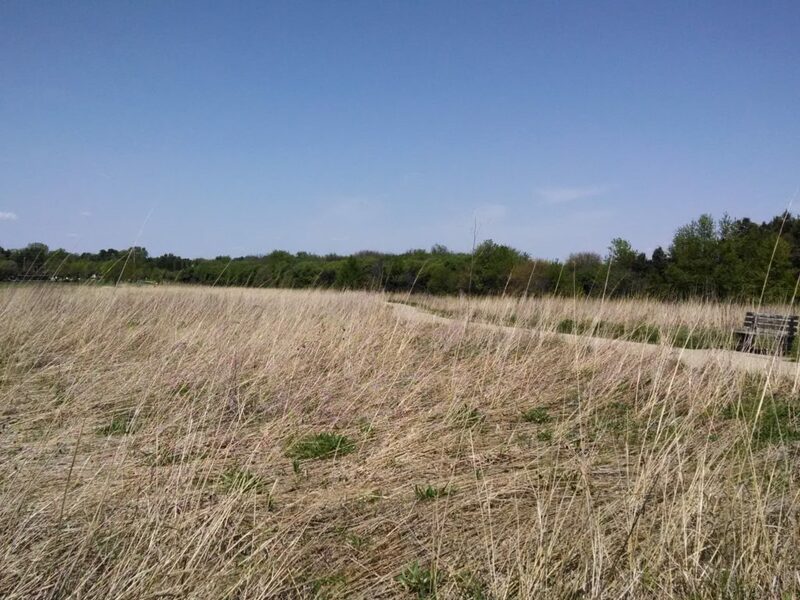 This picture at the bottom, taken on one of our very long walks leading up to our big Kal-Haven trail hike, is from a spot quite close to the Freyfogle Prairie Overlook.